With the market currently plummeting into the abyss, there is one ray of sunshine. We’ve all been waiting for this patiently and the TrezarCoin Devs have been hard at work. After this long wait, I’m happy to announce that on November the 20th it’s finally here! 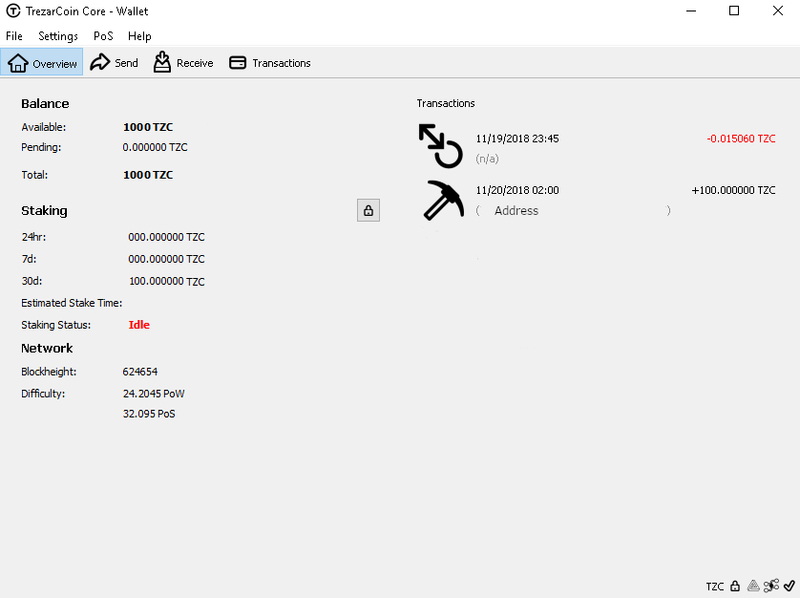 The Trezarcoin Wallet v1.2 is officially released and ready for use. While you’re waiting for it to download and reindex(explained below). There’s a lot to go over, but before that feast your eyes on the wallet. As you can see plainly, how staking is approached and seen has received a complete overhaul in this version. Due to popular demand, you can now see how much you are “expected to receive” in a given amount of time. Just to clarify, what is to be expected does not mean what is guaranteed. As you can see however, in the screenshot, Staking Status is “Idle“. There are now two ways to unlock your wallet for staking, the traditional way by clicking on Settings and “Unlock wallet for staking…” and a new easy and self explanatory way. By clicking it will immediately ask for your password and begin staking. Once staking has been activated a few things will happen. First Staking Status will become Active and the Estimated Stake Time will also display a time frame, for when a stake is expected after calculations are complete. These are illustrated below. The second indicator that staking is now active, is that a symbol in the bottom right of the wallet will light up green. . The last thing available to you, even though I’m not sure when you would ever turn staking off. Is if you click PoS at the top you can now enable or disable staking. If you are on windows like me, you will get a notification from windows, letting you know if staking is active or not. Now, on clicking PoS something else might have caught your eye, that’s right it’s called EasySplit. Honestly, the name speaks for itself, it’s an easy way to take coins form one address and split them evenly among however many addresses you choose. 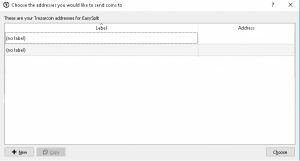 After clicking the EasySplit button, go to Coin Control and select the address you want to send coins from, many of you should be used to doing this. Next click the address book button. . A window like the below should appear. If you want to select multiple address make sure to single-click each address, double-clicking will select only one and close the window. From there enter the amount you want to use and click send. Something that many of have been plagued with for a long time, especially those that suffer from occasional power outages is a corrupted blockchain, not only is it a hassle to fix, it’s a time consuming issue and one that is always plaguing or discord channel. Well no more! With v1.2 there the TrezarCoin Devs have implemented a new database structure to help prevent corruption of the blockchain due to power outages or unexpected shutdowns. This however, does mean that the whole database needs to be re-downloaded(reindexed). It is important to note, SegWit does not increase the block size limit, but it does enable a greater number of transactions within the 1MB blocks. The 4MB cap includes the segregated witness data, which technically does not form part of the 1MB base transaction block. This is used for the lightning network. Now time for some techie talk to get into more detail. CSV or CheckSequenceVerify, provides for relative locktime the same feature CLTV provides for absolute locktime. LockTime is a field that specifies the earliest time a transaction may be added to a valid block. When the CSV opcode is called, it will cause the script to fail unless the nSequence on the transaction indicates an equal or greater amount of relative locktime has passed than the parameter provided to the CSV opcode. Since an input may only be included in a valid block if its relative locktime is expired, this ensures the CSV-based timelock has expired before the transaction may be included in a valid block.